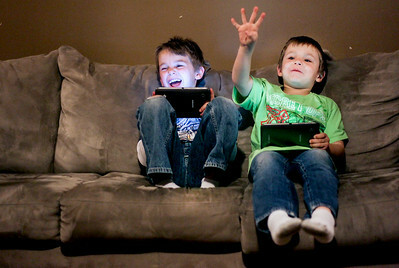 Sarah Nader- snader@shawmedia.com Jeremy Greenwald (left), 7, of McHenry and his twin brother, Joseph, play on their tablets while relaxing at home Tuesday, December 11, 2013. The Greenwald's have been waiting for a big brother for over a yeah. They are part of Big Brothers and Big Sisters of McHenry's 12 Kids of Christmas campaign, which is aimed at paring 12 kids with mentors over the holiday break. Sarah Nader- snader@shawmedia.com Jeremy Greenwald (left), 7, of McHenry and his twin brother, Joseph, read jokes to each other and color while relaxing at home Tuesday, December 11, 2013. The Greenwald's have been waiting for a big brother for over a yeah. They are part of Big Brothers and Big Sisters of McHenry's 12 Kids of Christmas campaign, which is aimed at paring 12 kids with mentors over the holiday break. 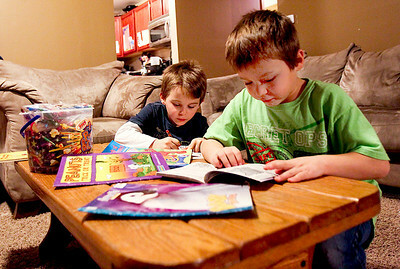 Jeremy Greenwald (left), 7, of McHenry and his twin brother, Joseph, read jokes to each other and color while relaxing at home Tuesday, December 11, 2013. The Greenwald's have been waiting for a big brother for over a yeah. They are part of Big Brothers and Big Sisters of McHenry's 12 Kids of Christmas campaign, which is aimed at paring 12 kids with mentors over the holiday break.